Ace Hoffman's Nuclear Failures Reports: You-Tube censors this activist (without explanation, of course)! You-Tube censors this activist (without explanation, of course)! Why would You-Tube take down a video of me speaking at a public rally on March 11, 2012? I have no idea! (See item #4, below.) You Tube has apparently taken a number of nuke-related videos down. What's going on? Also, was the steam generator problem that permanently closed San Onofre unique, or are other reactor's steam generator designs capable of experiencing "fluid elastic instability" (FEI)? Are they capable of suffering a cascade of tube failures, especially during a "blowdown" (loss of pressure in the secondary coolant loop)? And, is the Nuclear Regulatory Commission going to tighten up its rulings, so that utilities cannot claim a design is "like for like" just because the net result is 90% similar? Firstly, 90% isn't good enough when dealing with nuclear issues -- 99.9% may not be good enough. And secondly, current regulations -- believe it or not -- allow a large change in specifications (such as a large increase in operating temperature) to be compensated for in risk analysis by, for example, putting better-fitting insulation around the containment dome's openings, so that the larger steam explosion made possible by the higher operating temperature is as likely as before to be contained within the dome, since the seals are tighter. In most other industries, getting away with stuff like that is called "bassackwards." This past Wednesday several activists attended an IEEE meeting in San Diego during which two nuclear safety/risk analysis experts talked about what happened that caused a plant worth tens of billions of dollars to close permanently because of a $670 million part failure. Below is a letter written to one of the meeting's presenters, following up on comments made at the meeting. Several additional items are also shown below. (4) I want my video back up on You Tube! It was a pleasure meeting you yesterday and attending the IEEE meeting at UCSD Extension. I was surprised and pleased at how interested the attendees were in the subject -- especially considering that most of them were clearly unaware of any of the details of nuclear power, except for a few experts. The following is my opinion. My sources include conversations with nuclear workers at SCE open houses (who specifically told me the Unit 2 reactor 70% restart plan involved operating the reactor at full pressure and temperature in the primary loop), SCE public documents, NRC public documents, public hearings, and many other public sources. It is also based on conversations with former SCE employees (ie, whistleblowers). Since you've designed both nuclear pressurized water reactor steam generators and airplane wing airfoils, I'll try to skip everything I assume is normally known about steam generators and turbulence in general, but sometimes I'm sure these comments might appear to belittle your knowledge, experience, or intelligence. That is by no means my intent; I just don't know exactly what you know and what's been learned since your time in the field, nor do I know what's changed names (this happens all the time in the nuclear industry, as I'm sure you know). I also only studied SanO for the most part, so I don't know what's specific to SanO's problems and what the industry knows. And lastly sometimes a little context ensures clarity. One of these days I'll release the smartphone version I showed you last night but for now, it's only publicly available in the online version, although I can also send you an "exe" version for offline use if you like. In today's nuclear technojargon, Flow Induced Vibration (aka Fluid Induced Vibration) and Fluid Elastic Instability are two very different phenomena which can occur in steam generator tube bundles. However, I don't think anyone would expect to see FEI without also seeing FIV, and FIV is much more common. Both are illustrated in the above animation (along with the Mitsubishi Flowering Effect, Main Steam Line Break, etc.). Fluid Elastic Instability specifically refers to a type of coordinated vibration which is NOT random: In FEI, one tube's vibrations (the "initiator" tube) causes the tube next to it to vibrate in time with the first one, and then the next and next, limited "only by tube breakage or collision with support structures" (wording from memory, but based on NRC/SCE descriptions). FEI is a coordinated vibration which quickly becomes catastrophic if left unmitigated (by immediately shutting down the reactor). Flow Induced Vibration, on the other hand, is normally considered to be much more random. Small FIV-induced leaks of primary coolant into the secondary coolant loop sometimes plug themselves (with "crud") or at least stay tolerably small. N16 detectors, of course, are relied upon to know if there is a leak, but they do not say which tube (or maybe even which steam generator) is leaking, or why the leak is occurring. The "void fraction" or percentage of water to steam should not have been above about 98.5% steam and 1.5% water as it exited the top of the tube bundles. Instead, the upper tube bundles were well over 99% steam and less than 1% water (approximate values; taken from memory). Another cause of FEI was that the tubes were not restrained in the in-plane direction. There was no way to be sure that the extra twist that was manufactured into the Unit 2 Anti-Vibration Bars was enough to prevent FEI if that unit were restarted, or was what had prevented FEI in that unit in the first place. As I started to say last night at the IEEE meeting, the recirculation ratios were less than 2 to 1, meaning that for every pound of secondary coolant which goes up and out of the steam generator and into the main steam line to the turbines, less than twice that amount -- less than two pounds of water -- recirculates by coming out the swirl vanes and steam dryers and going back down the outside of the tube wrapper to the bottom of the steam generator for another time around the steam generator, without having gone through the turbines and tertiary loop condensers. Proper steam generator recirculation ratios should have been closer to 4 to 1, with most of the secondary coolant loop's liquid going around three or four times prior to exiting though the main steam line. Part of the restart plan involved properly increasing the recirculation ratios. Also, because of the lack of moisture, the tubes dried out from nucleate boiling, so that when the tubes banged into each other, there was virtually no damping whatsoever, and thus, far greater damage to the dime-thin tubes. Steam is, of course, far less adequate at damping than liquid -- about 30 times less. But the thin layer of liquid that should have been running up the outside of the tubes was also gone. Additionally, the dried-out area of the tube bundle -- caused by the above-mentioned problems -- in turn transferred heat out of the tubes from the primary loop less efficiently. This in turn caused a feedback loop of sorts, continuously overheating the local area of the tube bundle (the estimated heat distribution for San Onofre's steam generators can be seen in the animation by clicking in the tube bundle area). SCE's proposal to run at 70% was bogus. First of all, as I stated last night at the IEEE meeting and again in this email, the reactor itself was going to be operating at approximately 100% of normal primary coolant loop pressure and temperature. The main bleed-off prior to the turbines would be from increasing the recirculation ratios in the steam generators, with some adjustments to the flow rates and temperatures in the primary and secondary coolant loops. What was being called 70% power output at the turbines was not very relevant to the pressures and temperatures inside the steam generators. Not that there would be no reductions at all, and certainly not to say that small thermal and pressure changes inside the steam generators couldn't significantly reduce wear and tear during a five-month trial, but what really made the 70% idea bogus was that it did not cover the following problem: A cascade of tube failures caused by Fluid Elastic Instability during a blowdown following a Main Steam Line Break combined with a stuck-open Main Steam Line Isolation Valve. Such an accident scenario is normally expected to result in temporarily completely voiding the steam generators of water in the secondary loop due to the sudden loss of nearly all pressure on the secondary side. Normally, this isn't good, but if Fluid Elastic Instability can set in, it can be quickly become disastrous. I believe what permanently closed SanO was that there was simply no engineering principle to get around this problem. The specifications that tubes not be worn severely (not greater than 40% tube through-wall wear allowed, of a dime-thin tube, measured with an inexact probe) assumes that tube wear will be random and you won't have multiple tubes that are highly worn, with the wear spots sitting right next to each other, from tube to tube to tube. However, FEI causes such wear in adjacent tubes, and that's exactly what was seen in Unit 3. Evidence of FEI was not found in unit 2, although the exact reason why not was never established by NRC, SCE, MHI, Areva, Westinghouse, the independent experts, or anyone else. Even running at "true" 70% power, let alone what they were calling 70% power, would have provided essentially ZERO protection against a cascade of tube failures caused by fluid elastic instability during blowdown. From my perspective, that, in a nutshell, is why SanO could not re-open. Friends of the Earth's and other activists' contributions may have forced the NRC to fully consider the problems, but once they did that -- assuming they did that, and I think they did -- there wasn't going to be any way they could approve the reactor for restart at ANY power level. Hence the letters to SCE from NRC asking for something like 60 different highly technical responses being sent out on Christmas Eve? What I can't understand is why it took SCE a year and a half to give up! Reopening the plant with all the other wear and tear just wasn't going to be financially possible. You might remember the broomsticks-and-trash-bags leak repair job that made the news at one point. Insider stories painted numerous additional pictures of other rusted-out parts of the plant. Add in the fact that they did not have a good workable steam generator design (the old steam generators had vibration and wear problems too), and even if they did have a new design everyone trusted -- good luck with that -- it would take two years to build it, during which time the plant would continue to rust out and produce nothing. There was no way SCE could make money, considering that when they were asking for permission to put in the new steam generators, they claimed the replacement would save ratepayers a little over a billion dollars over a 20 YEAR period. That amount would get spent just waiting for the replacements, let alone building and installing them. When deciding to do the steam generator replacement at San Onofre, approximately a decade ago, such slim savings assumed nothing as serious as what went wrong could or would go wrong. Today's California Public Utilities Commission (CPUC) hopefully knows better! But in fact, much worse could have happened: Your N16 monitors could have been overwhelmed and their needles pegged if we had experienced a cascade of tube failures, as your co-presenter last night mentioned several times. This is important, because current NRC regulations predict, at most, a complete single tube rupture (a tube disengagement, I think it's called?). Regulations do not require the utility to immediately shut down the plant upon discovery of a small steam generator tube leak. Current regulations assume that tube leaks are solitary events involving flow induced vibration, not fluid elastic instability. SanO's January 31, 2012 event suggests the industry needs to rethink what a tube leak indication might mean: How can control room operators possibly distinguish between a FIV-induced tube leak and a FEI-induced tube leak? The former is relatively benign, but the latter can result in a meltdown, and could have at San Onofre that day, if the Unit 3 reactor had been kept running a little bit longer, instead of being almost immediately shut down (within about 20 minutes, I think we were told) because the leak was getting worse at an accelerated rate. Leak acceleration is always a bad sign, but particularly bad if the cause is FEI. This analysis strongly suggests that your N16 monitors saved SoCal from becoming a Fukushima-level event on January 31, 2012. Many thanks indeed for that!! This Saturday, the Public Interest Environmental Law conference at University of Oregon (You Owe) will feature climatologist and pro-nuclear power promoter James Hansen. Hopefully there will be a little more discussion about energy literacy before gasoline rationing finally arrives. It would be nice to see environmental groups use their networks to teach how to relocalize agriculture so we can eat on the energy downslope. Transition Towns would be a more practical response to our predicament than sending letters to politicians. Perhaps the California agriculture crisis this year will be a transformative event that wakes up the country to the supply chains of having our food grown far away from where it is eaten, ideally there will be enough rain and snowpack for the rest of the rainy season to make this merely urgent and not catastrophic. Einstein said the splitting of the atom changed everything except our way of thinking, thus we drift toward catastrophe. Passing the limits to growth on a finite planet changed everything except our way of thinking. I hope future generations are able to understand why we ignored the warnings. James Hansen claims small amounts of radioactivity might be beneficial, biologically, which is a lie. Only time can make nuclear wastes harmless and non-radioactive. The "Human Events" article Hansen cites as justification for the hoax of "hormesis" (small amounts of radioactivity are supposedly good for you) is an article by Ann Coulter a few days after the meltdowns at Fukushima. Ms. Coulter has written many nasty articles about Mr. Hansen yet he cited her to justify the claim that radioactivity has minimal or even beneficial health impacts, and therefore new nuclear reactors are acceptable. Many studies of radiation victims show health effects are supra linear — small amounts are more toxic per unit of dose than large amounts. 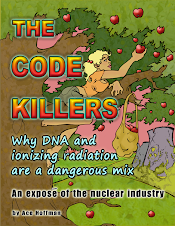 A good compilation of nuclear radiation impacts is at www.ratical.org/radiation/ One resource there is the work of Dr. John Gofman, MD PhD, a veteran of the Manhattan Project and founder of the biomedical division at Lawrence Livermore. He was forced out of Livermore for concluding the rush to build nuclear power reactors would be dangerous. It's fascinating that Hansen was courageous in warning about the impacts of climate chaos yet echoes industry's lies that new nuclear reactor designs are supposedly safe and can run on their own waste (they cannot reuse fission products). All reactors make nuclear wastes that cause genetic damage. Nukes are not a good way to boil water. I'm thrilled to announce that my new ebook, Yes, I Glow in the Dark! One Mile from Three Mile Island to Fukushima and Beyond, launches on Amazon Kindle on Thursday, February 27, 2014! It's a nuclear memoir that takes me from being waaaay too close to the Three Mile Island nuclear accident in 1979 through years of nuclear denial to Fukushima and my current position as producer/host of Nuclear Hotseat. Told in a breezy, often "Jon Stewart-esque" manner, it includes important information to understand our ongoing nuclear risks... and what each of us can do about it. Here's the url to buy the book: http://amzn.to/1llNo2w . You can also read the first chapter there if you want a taste of what's to come. Please support me by buying this ebook. Here's how you can also help: send this email to others you think would be interested. Post the info on sites you visit. Put it on Facebook and social media. We all need to understand what we're up against with nuclear interests. This ebook puts a human face on the problems, along with zippy narrative and unexpected humor to keep the reader engaged. Thanks for your support. Here's to a successful launch and an unstoppable anti-nuclear future! On February 25, 2014 You Tube removed a video of a public speech I gave at a Shut San Onofre nuclear power plant rally on March 11, 2011, saying it violated their "terms of service". But this was just free speech in action! The rally was legally permitted and had (calm) police presence. It was held in the public park south of the reactor site (which is now permanently closed!). Several hundred people were present at the event, including children, young adults and reporters. More than a dozen people spoke, all spoke the truth, and no riot was incited by anyone. The video had been posted at my YT channel for nearly two years. It is unfathomable what You Tube's reason could be for removing this video at this time (or any time). The video had 144 views and 3 "likes" at the time of removal. It did not have a single "thumbs down"! Please sign my petition asking You Tube (owned by Google) to reinstate this video!